Super Typhoon Trami, as seen from Japan's Himawari satellite on Sept. 24. Image: CIRA/RAMSDIS. Super Typhoon Trami exploded in intensity from a tropical storm on Saturday to the verge of Category 5 intensity on Monday. The storm is slowly moving northwestward, spinning closer to Taiwan and southwestern Japan. 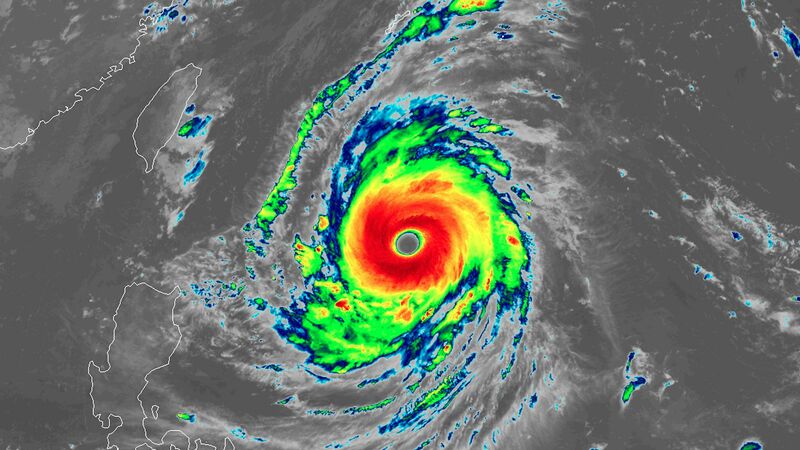 The big picture: Super Typhoon Trami is expected to reach the equivalent of Category 5 intensity as it moves slowly over some of the warmest waters in the Northern Hemisphere. By Sept. 29, it will be nearing Japan's Ryukyu Islands and northern Taiwan. Given the track uncertainty this far in advance, the storm is considered a landfall threat to Taiwan. For now, meteorologists are eyeing it warily and with wonder given its rapid increase in intensity, massive 60-mile-wide eye, and oscillations in direction that appear to be related to its rapid-fire intensity surge. If it were to turn farther to the north and bring more impacts to Japan, it would be one in a string of damaging storms to hit that nation so far this typhoon season. What's next: The Joint Typhoon Warning Center will continue tracking the storm, along with the Japan Meteorological Agency.